Hyundai’s worldwide ‘Live Brilliant’ campaign (on since the middle of this year), has been an first-rate attempt at capturing and reaffirming the strong emotional and positive connect that customers have with the Global brand and celebrates excellence that the ‘modern premium’ brand stands for. The digital component is superbly rendered. The Brilliant Way landing page is programmed to Seoul for India (sad!) and shows a count of the distance travelled basis user video uploads received. 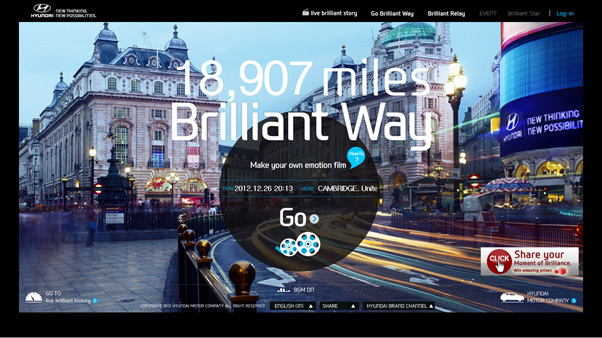 The campaign gets customers to share brilliant and happy moments of their lives with their Hyundai. The pre-recorded short form videos are amazingly shot and the soundtrack is a perfect fit (apparently from the movie ‘Like Crazy’). 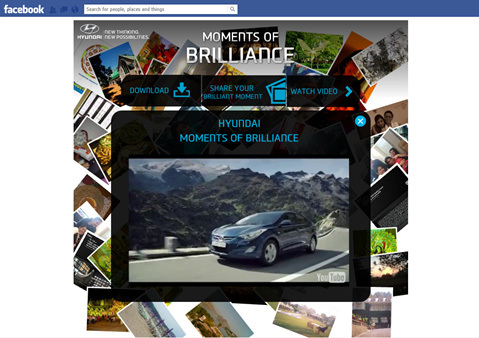 In India, the Hyundai Brand Channel on Facebook, hosts a Moments of Brilliance app that gets users to share their pictures. I loved the personalised app background which is a collage of your Facebook pictures. A mobile app also allows users to share moments on the go. I wish Hyundai India would take a cue from the Global campaign and inject some ‘new thinking’ into their campaign executions on the web, next year!